Keep your feet toasty with home-knitted socks, which you can customize with whatever patterns or colors you want. This free pattern promises that they are “so simply designed that they almost make themselves,” so there’s really no excuse for cold tootsies. Slippers are another easy way to keep your feet warm and protected from the dirt on your front porch or the weirdness of going down to your basement laundry room in bare feet. Plus, you can customize them to your actual foot size instead of dealing with the too-small or too-big sizes offered by store-bought slips. Try out these free patterns, many of which are designed for beginners. Get a head start on next year's holiday decorating by knitting your own stocking. Rather than boring red-and-white stockings, go for for something a little more custom—reindeer-decorated stockings or stockings emblazoned with the name of their owner. Stuffed animals don’t need to come from a store. You can fashion your own crochet lions, knit teddy bears, and yarn dolls. These patterns are just a few dollars each, and are sure to become beloved possessions. Plus, if they get a little too well-loved and start to wear, you can always do your own repairs. Making fingerless gloves can be relatively easy, depending on the pattern. They’re great for wearing in cold offices when you still need to be able to type, or even for doing more knitting when the house is chilly. Once you get the hang of circular needles, hats are a relatively quick knitting project to complete, giving you that instant satisfaction of a job well done. From slouchy beanies to cable knit caps to berets, you can make just about any style of hat in whatever color pattern you want. Add buttons or switch up your stitch to make a hat with a dash of flair. Because they’re just a circle of fabric, ear warmers are super easy to throw together, and they’ll keep your head nice and warm on freezing days. You can choose how thick to make your ear warmers depending on the weather in your area. If a simple headband-style ear warmer isn’t fashion-forward enough for you, you can add knitted decoration like flowers. But they don’t have to be overtly feminine in style, either. Some patterns will show you how to make a slightly more gender-neutral accessory, so everyone you know can enjoy properly warm ears all winter. Winter is a time to stay warm, but not too warm. Enjoy your hot beverages without burning your hands by making your own cozies. If you're out at a coffee shop, using your own coffee sleeve is a great way to feel just a little less guilty about your disposable cup use. Check out this list of free patterns. 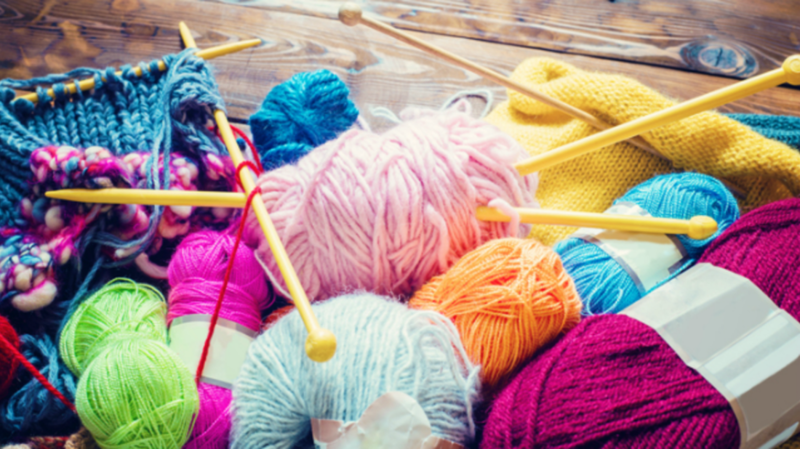 You don’t even need knitting needles for this one. The Ukraine-based designer Anna Marinenko makes blankets out of massively thick yarn, sometimes using her hands instead of needles. (She also sells specially crafted 2-inch thick needles for “bulky knitting” on her Etsy page.) You can craft a blanket so big—with stitches a full 3 inches thick—you’ll feel like you’ve stolen a giant’s comforter. There are free instructions on how to knit with your arms from the blog Flax and Twine, or you can watch the video above.